Hi all I'm interested in having a go at fishing with soft plastics and am just looking for some advice on what to use how to rig them up etc. I have had a bit of a go with them before with out much luck probably due to not knowing what I was doing. Also any advice on lures would be good I've only ever done trolling with lures. Just looking at different ways to go fishing. hey mate I only use soft plastics/hard body lures when I go fishing. what are u chasing as this will depend on what soft plastics and jig heads u will use. My biggest piece of advice would be, when u go out for a fish, pick a target species and stick to just trying to catch that particular species. sure as sh*t you will have a few sessions where u will get nothing but its all part of mastering the art of lure fishing. Thanks navman normally when I go fishing it's for fun if I catch anything it's a bonus. The only time i Really target anything is when I go to Double Island when I go for Whiting, Flathead and Tailor. Might buy a bit of a selection and see how i go with it. You can't go wrong with a 3in glup in pumpkin seed colour for flatties - definitely my go to plastic. Just be sure to let the plastic sink and hit the bottom before working the lure. Many people new to fishing with plastics fish them way too fast and don't let them sink. Yeah i find researching and picking a species you are after when you head out helps a lot as all species like different things and types of lures. There will be times when you get nothing but there will also be times when you get other fish then you've targeted as well. I know myself when fishing for trout and using tassie devils that i could use 2 or 3 different designs and have no luck, then change to a different design again with almost immediate results. So i guess another piece of advise is be prepared to constantly change lures and soft plastics if one isnt working for you. Thanks for the advice guys as soon as the backs a bit better I will be out after them. Like the idea of chasing the flatties looking forward to that. What type of jig heads do you use with them Shaun? I guess it comes down to personal preference on what type of jig heads you use. I like the ones that have teeth near the eye that help the plastic stay on the jig head better. Just make sure that you use one consistent with the conditions, eg. one that has enough weight to get your rig to the bottom. You'll need 3 completely different rigs for the three target species you mention. Whiting on plastics/poppers requires ultra lightweight gear, finesse and an abilty to avoid wind knots in braid whilst casting something that weighs about the same as a fingernail - I do not call myself a successful whiting lurer. Tailor have razor sharp teeth and will kill a plastic lure just by looking at it. They need a rod/reel that will cast a metal slug a fair distance, then retreive it at a fair rate. 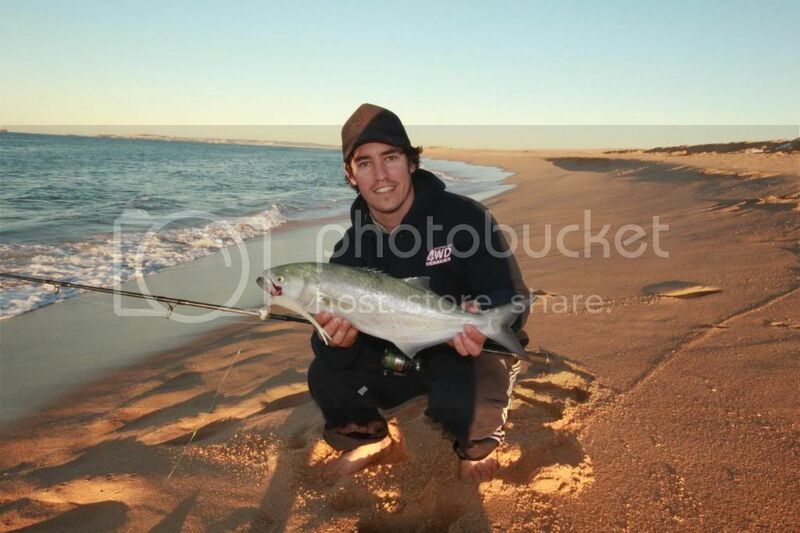 I use a garry howard moreton bay spin with a 6000 shimano reel for a session of slug chucking. You can do it with a surf rod and an alvey, just not as long or well as with a dedicated high speed outfit. You can throw plastics at lizards at DI with a modicum of success, but if you trade the plastics for a juvenile long nosed sand mullet (baby whiting, but then you'd be 'in posession' of an undersized fish.....) you'll catch approximately 10 times more lizards and most will be too big to keep - just saying. Use a jig head with a longer shanked hook for lizards, 1/3 oz and bigger for the surf with 4" paddle tails in bright pinks and chartreuse. As stated before, pumkinseed is deadly in the calmer water and creeks. Thanks for the advice will take it into consideration. As I said I go fishing for fun if I catch anything it's a bonus. Shauno got this one when we were at Stocko a couple of weeks ago, you would have seen it if you follow the Modern Fishing Facebook page. I've used them on the odd occasion and caught an average size jew and some flathead in the surf with them over the years. The jew was caught on a very early model glow in the dark shad about 150mm long. Nice looking fish. As soon as the backs a bit better I'm out and after them. I've had a fair bit of success with the bushy and starlo(I think) soft plastics. They come with this "s factor" scent. Weather you use it or not is up to you. I've got heaps of flattys and bream, a toad fish lol. I've used gulp but not as much. I use the finesse jig heads when there's little wind chasing bream. But usually just use the right jig for the right size plastic in the right conditions. You'll work that out. They also say use a plastic that blends with the water colour. Again, up to you with that one. I've had equil success with all colours couldn't tell you what's the best. I do have a favorite colour, red with black glitter, don't know why I just seem to always try that one first. couldnt agree more with shaun w. pumpkin seed is a winner for flatheads, works pretty well with bream over here in wa also, my other favorite colour is motor oil for bream, i never really believed in using plastics until last year wen my fishing mad mate proved to me that they work - and work well. he always used to say, "I'LL only smell like fish, when i catch one - you can keep your bait"
Finesse grubs epitomized by the Slider tails and their clones. Most are straight grubs with a small, paddle-shaped tail. Their action looks tame and restricted, but the little tail is actually kicking at the slightest movement. These finesse grubs, can be deadly on inactive, shut-down fish, as well as a host of fish not normally considered to be regular lure takers. Finesse grubs are best worked slowly, with gentle lifts and drops, or by simply holding the rod up at 45 degrees and winding the reel slowly and steadily. I'm trying to get used to plastics too. My problem is I work for a bait company, so I have an endless supply of bait & I seem to always go back to it. However I do take a lure with me & have a bit of a flick.